Last Friday it was my friend's birthday dinner and we went to a restaurant called Dim T. They offer oriental food - Chinese, Thai, Japanese and Malaysian dishes. So let me start off with the pros. Personally I thought the best thing about this restaurant was its location. 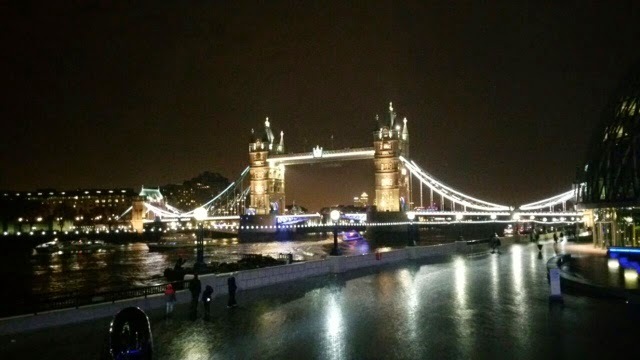 London Bridge was right in front of the restaurant and the view from there was just extraordinary. It was pretty average but I don't think that food at a restaurant should ever be average it should be better than that. My friend who recently stopped eating meat and is now a vegetarian really did not enjoy her food at all. One thing which was disappointing is that there was not much choice for vegetarians. There was just about 3 main dishes on the whole menu suitable for vegetarians. As well as that we were not really able to tell what exactly she had on our table. We knew that there was a deep fried aubergine but that's about it. So if I was a vegetarian I would personally not enjoy the food. There was a good atmosphere but after a while it started getting really hot and stuffy which wasn't pleasant at all. I'm not sure why this happened but we paid a deposit to reserve our seats beforehand at the end of the night they refused to take off the deposit on our bill and one of their reasons for this was because some but not all of us turned up late. It was a surprise party so obviously the birthday girl will turn up late? We've clearly told them that it was a surprise party before. I don't think that I will go back to this restaurant again, the only reason I might recommend this place is because of its amazing view of London Eye. So overall, 2/5 stars for Dim T.
But thank you so much Asha I really enjoyed your Birthday party, it's not the birthday diner that I was disappointed about , it was the staff at the restaurant that has let me down.